We’d love your help. Let us know what’s wrong with this preview of Detective Barelli's Legendary Triplets by Melissa Senate. To ask other readers questions about Detective Barelli's Legendary Triplets, please sign up. A wonderfully encouraging, fun and entertaining, adorable and ardent story about a marriage of accident while trying to tackle life, love, and multiple children. This story had me smiling big throughout it while reading, it has such a positive, heartening, supportive, hopeful tune and atmosphere. It is all about how it takes a village to raise a child, not to mention multiples, and it shows by example how we, as women and people in general, should build up each other, support, and offer a helpin A wonderfully encouraging, fun and entertaining, adorable and ardent story about a marriage of accident while trying to tackle life, love, and multiple children. This story had me smiling big throughout it while reading, it has such a positive, heartening, supportive, hopeful tune and atmosphere. It is all about how it takes a village to raise a child, not to mention multiples, and it shows by example how we, as women and people in general, should build up each other, support, and offer a helping hand when needed. Norah Ingalls and Reed Barelli have both been disappointed in love, and not looking for a relationship, not to mention to get married. But things happen with a spiked punch, and they have to figure out what they want in life to deal with the consequences. Norah is such a survival, strong, tough, capable woman. She is not perfect, she does feel at times overwhelmed, who wouldn't with three seven-month-old babies, but she is doing it, she is doing it well, with the help of family and friends. Reed is a dream man, even with his apprehension towards romance and love. He has a strong sense of responsibility, he is protective, kind, loves babies, and is not afraid of a dirty diaper. The sizzling connection between Norah and Reed, the palpable attraction, the obvious feelings they have for each other, and how they try to avoid them and deny them while on the bumpy road to the acceptance and embracing the feels, the desires, the dreams of the future is heartfelt while enjoyable, enticing, and so alluring... A true feel-good story that made me smile and gave me all those warm and fuzzy feels inside. A perfect summer reading material, for sure! Norah Ingalls gets the surprise of her life. Loved the first scene between her and her sister, Shelby. I could see the whole thing play out in my head. Reed Barelli thought a job change would be good for him. Our author writes that endearing scene that you can’t help but fall in love with. That’s when it’s becomes really tough to put it down – even when you come across scenes where you want to yell at the both of them. Our author takes great care when developing her story. She could have just created the story between Norah and Reed but she shows that there are people in the town they live in. We have characters that you wouldn’t mind having in your life. And one that bakes that just kept making me hungry. Ms. Senate even takes things one-step further by including some of the history of her town. On top of that she gives us a little mystery surrounding one of the townsfolk. If you love babies, a man who seems to have the right touch with said babies, and is really romantic than you can’t go wrong by adding this into your library. We have two people who seem to be so perfect for each other but... In researching Shelby, her story is in the book titled Baby Switch. After reading this book I found myself wanting to know more so I’ve added her book to my TBR library. This book was a reminder of what I love about the Harlequin brand – I always seem to be able to just relax and enjoy what the author has written. And I always seem to get an ending that puts a smile on my face. This is actually the first time I have read anything by Mrs. Senate. But I love Harelquin special edition books and this one looked good. I mean who can resist a book with cute babies on the front of it? Plus I have to say that I love single parent type books. I liked Norah.... And that's Norah with an H, at the end (you'll just have to read to know what I'm talking about). But no seriously though, I did enjoy her. I thought that she was a very independent woman who was doing surprisingly well This is actually the first time I have read anything by Mrs. Senate. But I love Harelquin special edition books and this one looked good. I mean who can resist a book with cute babies on the front of it? Plus I have to say that I love single parent type books. I liked Norah.... And that's Norah with an H, at the end (you'll just have to read to know what I'm talking about). But no seriously though, I did enjoy her. I thought that she was a very independent woman who was doing surprisingly well raising triplet's on her own. Though she does have a bit of help in the form of her mother, aunt, and sister. I also found her to be a bit transparent also, even though she said she wasn't looking to be in a relationship. You could tell that, that's what she really wanted. I really liked Detective Reed, and that's Reed with two E's (again you'll have to read to know what I'm talking about). Oh Holy Moly Gee Whiz, Reed was such a sweet, kind, caring, and protective person. And no I don't think that totally had to due with the fact that he was a cop. I just think that, that's just the kind of person Reed is. I just loved how he was with the triplets. For my first book by Mrs. Senate, I thought that this book was a fun and sweet read. I really enjoyed the aspect of this church in their small town being cursed and everyone being blessed or cursed (depending how you look at it) with multiplies after being married there. This book just made me want to read the other books in this series. I'm giving this book 4 Stars out of 5!!!!! Detective Barelli's Legendary Triplets by Melissa Senate was an enjoyable read and I found myself thinking (hoping) that I knew how it would end. The interaction between Norah Ingalls and her family was amusing – Norah's marital status won't remain as "single" given all their encouragement! In fact, their willingness to babysit for her triplets allowed Norah to attend the Wedlock Creek Founder's Day Carnival. Here we find Norah (aka Angelina) drinking a bowl of two dollar a cup spiked punch with Detective Barelli's Legendary Triplets by Melissa Senate was an enjoyable read and I found myself thinking (hoping) that I knew how it would end. The interaction between Norah Ingalls and her family was amusing – Norah's marital status won't remain as "single" given all their encouragement! In fact, their willingness to babysit for her triplets allowed Norah to attend the Wedlock Creek Founder's Day Carnival. Here we find Norah (aka Angelina) drinking a bowl of two dollar a cup spiked punch with the ever so handsome newcomer Reed (aka Fabio) until they lose all inhibitions. Fulfilling Norah's long-held wish, they impulsively marry at the Wedlock Creek chapel – an act they will struggle to remember the next morning. They wake up, in the fog of hangovers, wearing matching wedding bands and though technically married, it was under the influence so surely it can be undone . If only fate, and a host of conspirators, would allow it. 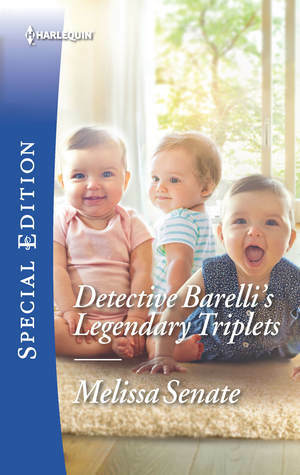 Detective Barelli's Legendary Triplets by Melissa Senate. This is the story of Norah Ingalls and Reed Barelli. Norah who is a new mother of three triples went out for a night at the Wedlock Creek Founder's Day Carnival while her sister watch the babies. There she met Reed who when he went to introduce himself she told him that they should just make up names and have fun. Which they did and along the way they ended up with a bowl of spiked punch that lead them to be tipsy. When Norah made the com Detective Barelli's Legendary Triplets by Melissa Senate. This is the story of Norah Ingalls and Reed Barelli. Norah who is a new mother of three triples went out for a night at the Wedlock Creek Founder's Day Carnival while her sister watch the babies. There she met Reed who when he went to introduce himself she told him that they should just make up names and have fun. Which they did and along the way they ended up with a bowl of spiked punch that lead them to be tipsy. When Norah made the comment that she would liked to be married in The Wyoming Multiples wedding chapel a drunk Reed said lets do it. Next morning they both wake up in her house with gold wedding rings. They first think that the marriage isn't real but they start to find out that might not be the case. What a fun romance! Loved it! Detective Barelli's Legendary Triplets by Melissa Senate is a witty and fun , very entertaining rom/com. Norah Ingalls is the single mom of infant triplets. One drunk night out leads to a married mom of infant triplets, Norah. Detective Reed Barelli never wanted the commitment and a marriage. Hes city cop, new in Wedlock Creek. Both meet and theres crazy insta chemistry. Both agree on a night out in Las Vegas and bam, married with a major hangover. And now they have to make it work. Detective Barell Detective Barelli's Legendary Triplets by Melissa Senate is a witty and fun , very entertaining rom/com. Detective Reed Barelli never wanted the commitment and a marriage. He´s city cop, new in Wedlock Creek. Both meet and there´s crazy insta chemistry. Both agree on a night out in Las Vegas and bam, married with a major hangover. And now they have to make it work. I love the little town legend behind their local church. Lots of miscommunication leading to hilarious moments and to hurt feelings. I adore the triplets and then learning in the epilogue whether they had more multiples. The trip to Vegas to find a missing citizen from their town led to more hilarity and tons of steam. This was a lighthearted read that I quite enjoyed. I'll be revisiting this town. Cute but I needed more of the resolution. We see Reed at the Wedlock Chapel contemplating if he could make his “partner marriage” work out as a real one and then, boom! All of a sudden he’s in Norah’s kitchen with an engagement ring? Yeah, I’m gonna need to get a little more insight into his thought processes there. But hey, I guess it turned out OK in the end right? Mixed feelings about this one. The legend is unbelievable but that's the point of legends sometimes right? The love story or anti-love story was pretty good, fighting feelings is pointless. This was a decent quick read. If you like multiples and legends this is for you! Such a sweet romance with adorable babies and a mini mystery mixed in. I can't wait to read the other Wyoming multiples books. Not sure how I feel about this one.Not what I'm used to.It held me in but I didn't really like it. I'm the author of many novels, including my debut, SEE JANE DATE (also available in cute TV movie form to stream); THE LOVE GODDESS' COOKING SCHOOL; and THE BABY SWITCH. I've had two novels published under a secret pen name, but I will happily share if you message me to ask! I'm now writing romances for Harlequin Special Edition. Coming in March: TO KEEP HER BABY. In June: RUST CREEK FALLS CINDEREL I'm the author of many novels, including my debut, SEE JANE DATE (also available in cute TV movie form to stream); THE LOVE GODDESS' COOKING SCHOOL; and THE BABY SWITCH. I've had two novels published under a secret pen name, but I will happily share if you message me to ask! I'm now writing romances for Harlequin Special Edition. Coming in March: TO KEEP HER BABY. In June: RUST CREEK FALLS CINDERELLA (part of Montana Mavericks Six Brides for Six Brothers series). In July: A PROMISE FOR THE TWINS. And in October, a holiday-themed romance. I'm the proud mother of a terrific 16-year-old son. We (and our dog and cat) live on the coast of Maine.